No deck. Or patio. Or entertaining space of any kind. We needed to fix that situation, and quick! 🙂 Per usual, Donnie dove in and started researching options for our backyard area, so I’ll let him share what he figured out! 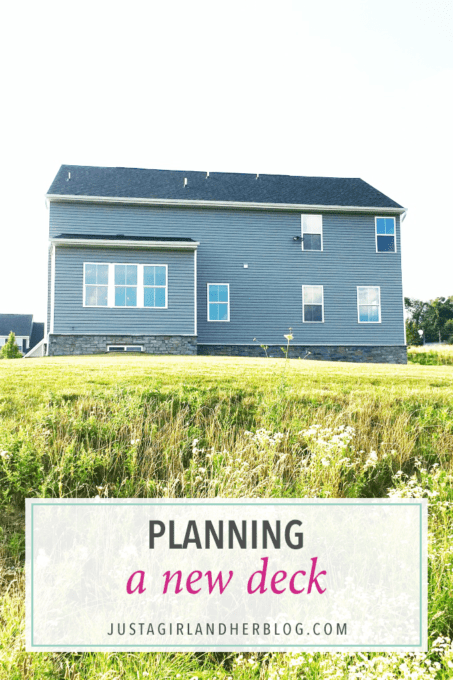 When building our new house, we used a community builder (rather than a custom builder), and that meant was that we would be responsible for building a deck or patio after we moved in. During the design phase of our house, we didn’t know with certainty at what height off the ground our back sunroom door would sit. There were too many possibilities of what the builder could run into while digging the foundation. We ended up with a back sunroom that is about 4 feet off the ground, which left us with some flexibility. We could choose to step down a few steps to a patio or walk straight out onto a low deck. Ultimately we decided that visually it would make the most sense to do a new deck (with the potential to add a patio area off the deck sometime in the future! ), and we couldn’t be more excited about the outdoor living area a deck will provide us. Once we decided that the first phase of sprucing up our backyard would include a deck, the next decision we were faced with was choosing decking material. Ten or fifteen years ago there would’ve been a good debate between real wood versus a composite or polymer deck. Things have changed a lot in that time, though, and for most climates and situations I don’t think there’s much of a debate anymore. While a composite or polymer deck is initially more expensive than wood (maybe 25% more in material cost), it doesn’t have a big impact on labor costs for installation, and it certainly saves a lot of maintenance time and expense over the long term– wood decks require power-washing and re-staining every few years, and after several years of being exposed to the elements, they definitely show some wear and tear. Once we had ruled out a wood deck, we then had to decide between a composite deck board and a 100% PVC deck board. Composite decking, which is a mix of wood fibers and plastics, has been around the longest and has had its share of success and longevity, as well as its share of failures in durability over the longer term. The newest decking material technology uses 100% PVC or recycled plastic deck board. Unlike composite, these deck boards have no organic material, which means that they are much better able to resist fading and rotting. 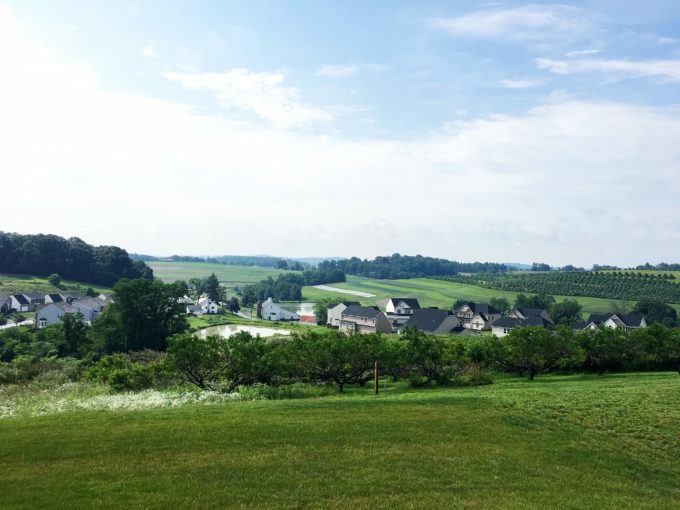 In Pennsylvania, we have all of the seasons: cold and snowy winters, wet and rainy springs, hot and humid summers, and crisp and cool falls, so we needed to make sure the material we chose wouldn’t fade or rot over time in those extreme conditions. 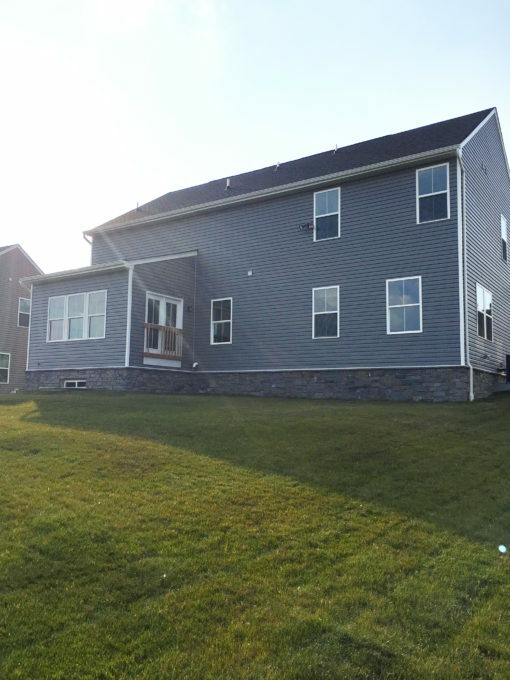 In the past, composite deck boards looked much more realistic than 100% in-organic material deck boards, which is why people would opt for a composite material over PVC. Recently, though, manufacturers have created a thin plastic cap or wrap to the deck board, which has made 100% PVC boards incredibly scratch resistant and has given manufacturers the ability to add detailed wood texture to the deck boards, making them look just as realistic as the composite material. Ultimately, we decided it was worth it to spend a little more on a 100% PVC deck board that would hold up the best in the long run. Which decking manufacturer should we choose? After doing my initial research, it was time to look at specific decking brands. I ended up considering about a dozen decking manufacturers, including AZEK, Deckorators, Fiberon, TimberTech, and Trex. During my research, I spent way more time than I care to admit reading through decking contractor forums to get an idea for the preferences of the professional installers. I reviewed the manufacturers’ websites to check out all of the different choices they offered, from color and texture to railing design and installation options. I talked to other families in our neighborhood who had installed decks to hear about their experience and get their input. I then scheduled deck installation estimates with some recommended local contractors and I asked each one what decking material they use. Each one said that while they can use any decking manufacturer in their builds, there was one that they thought looked the best and had the best durability. The general consensus of the forums I read and each contractor I met with was that AZEK was the very best option when it came to choosing decking manufacturers. After we had reached the conclusion that we definitely wanted to install an AZEK deck, we contacted them to see if they would be interested in partnering with us on our deck project, and we are thrilled to be collaborating with them to install a beautiful, durable deck that our family will be able to enjoy for years to come! AZEK deck boards are 100% PVC and unlike composite decking contain no organic material, which is a big advantage when it comes to fade resistance and rot resistance. The added faux wood grain and texture look very realistic. Lots of different color and pattern options. No plastic sheen or fake look. AZEK deck boards seem very scratch resistant. I tested this with a knife and my car keys on our AZEK samples. AZEK boards use the newer plastic “shell” or “cap” technology. AZEK offers a 30 year stain and fade warranty and a limited lifetime warranty against material defects and rot. This is a longer warranty than most. The only maintenance is a light washing with soap and water. Once we had decided on the material and manufacturer we wanted to use, we also needed to decide on a design for our deck! I looked at approximately 1.1 gazillion decks on Pinterest (That’s totally a number, btw. 😉 ), trying to figure out what I liked and what I didn’t like. We were also able to play around with AZEK’s Deck Designer tool to test out different options and see what combinations of colors and styles looked good together. Ultimately we decided that we wanted a deck that would span almost the entire length of our house next to the sunroom and would also extend past the sunroom depth a few feet. We chose a gray tone– AZEK’s Island Oak— for the main part of the deck, along with a darker border color called Dark Hickory. We decided to go with white railings that had square black balusters, which will impede our view the least while sitting on the deck so that we can enjoy the beautiful rolling hills in the distance. The deck is designed in such a way that we would have the option to add a roof over part of it if we choose to do so in the future. Do you have any deck tips or tricks to share? I’d love to hear about them in the comments! Thank you so much for following along with our journey! Have a wonderful day! 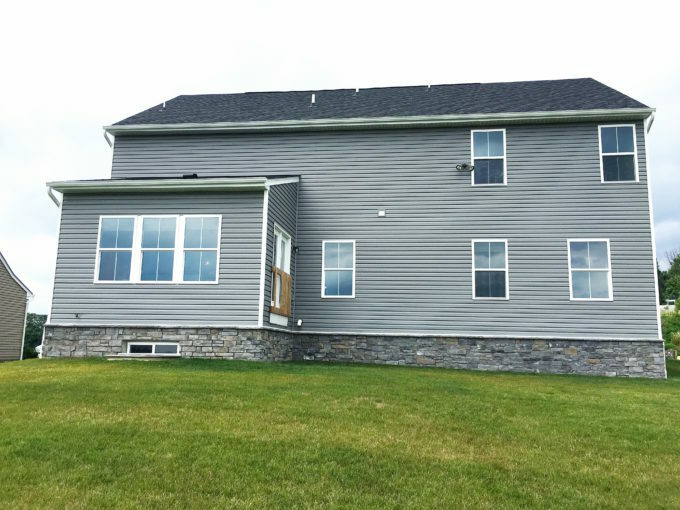 A huge thanks to AZEK Building Products for collaborating with us on this project! Our favorable opinions of beautiful, durable decking are 100% our own. For more information, see our disclosures here. Hi Abby, looks like your new deck will be lovely! Your view over those hills is even lovelier!! We made a mistake 10 years ago when installing our deck….dont make the same one! Our railing is topped, and bottomed, with a 1×3 board which we set the railing spokes into. The problem is, as soon as we sit in our comfy chairs, the 3 inch wide board is smack at our eye level😢. So we sit up really straight to see over the top or we slouch down to see through the railing. Ooh good to know! We will keep an eye out for that! Thank you so much for your sweet words, Sarah! Have a great week! Abby, the deck looks awesome. My husband and yours are very similar. They do thorough research and reading before making a big purchase. I enjoyed reading your post in that you included your thought process, findings, and ultimate conclusion. It helps to know the “why” of someone’s pick. I can’t wait to see your deck finished. 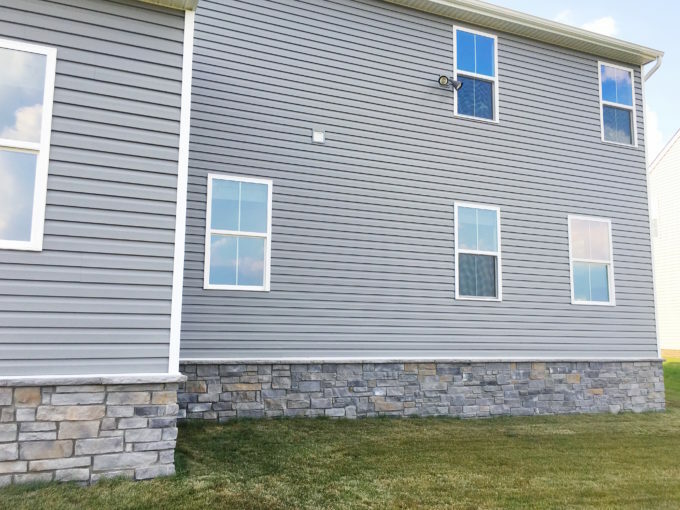 The gray with your gray siding and stacked stone looks smashing! Enjoy! Thank you so much, Jolene! You are right– our husbands sound very similar! I am so thankful that he is a big researcher because I’m more of a “just jump in and do it” type of person, so he balances me out, lol. Thank you so much for your sweet words! Hope you’re having a wonderful week! Would you recommend the contractor? I live about 20 minutes from the farm market you live near, and we need to build a deck, too. We got a couple of quotes before, but I hadn’t heard of this company prior to your post. Thanks!! Hi, Sam! We have liked them! They had a long list of people in front of us, so it took them a bit to get started, but now that they’re working on it, everything looks beautiful and they have been great to work with. (And we tend to be picky about projects with our house, so they have been patient with us, lol!) I hope this helps! This is going to be beautiful and will surely be your favorite outside spot to watch your boys play. Yes! I can’t wait! 🙂 Have an awesome week, Debbie! Hi Abby, the view from your deck will be gorgeous! I’ll have to replace mine next year and I was dreading looking into materials, but the legwork you and Donnie did will be a big help. I love the little bay-style extension on your deck – that will be great for a buffet table during parties, a bench, or an outdoor toy chest for your boys. Hope the install goes well! So glad it will be helpful, Amy! I can’t wait to relax and just enjoy the view! 🙂 Have a great week!